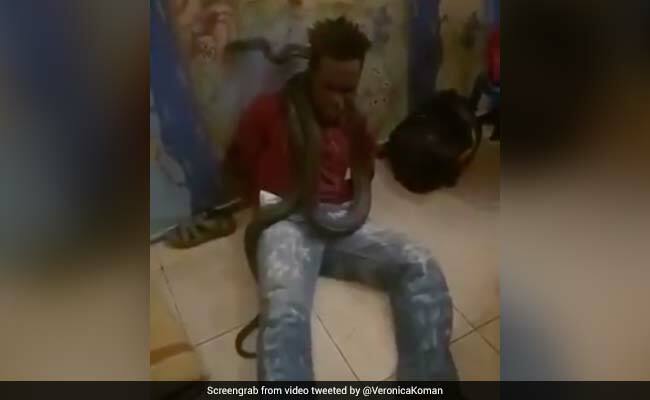 Indonesian police have apologised after officers draped a live snake around the neck of a suspect to persuade him to confess during an interrogation session. A video shows the man yelling in distress as a snake is pushed towards his face by an officer. The man, who can been seen writhing on the ground for much of the time is asked by an officer, "How may times have you stolen mobile phones?" The suspect later responds by saying, "Only two times." During the video, a voice can be heard ordering the man to open his eyes and at one stage threatens to put the snake into his mouth and under his trousers. In a statement, Jayawijaya police chief Tonny Ananda Swadaya issued an apology, saying, "The investigator was not professional in doing his job". Swadaya added that the officers had been acting on their own initiative to try get a confession, saying the snake was non-venomous and tame. "We have taken stern action against the personnel," he said, adding the officers themselves had not physically attacked the man. Papua police spokesman Ahmad Musthofa Kamal said the case was being investigated by the internal affairs unit and if violations of the law or code of conduct were proven action would be taken. Reports of human rights abuses by security forces often emerge from Papua, where a separatist movement has simmered for decades. The former Dutch colony, the resource-rich western part New Guinea island, was incorporated into Indonesia after a widely criticized U.N.-backed referendum in 1969. Veronica Koman, a human rights lawyer focused on Papua, said by text message that using a snake in this way represented torture and was not a one-off incident in the area. Koman said a snake had also been used in an interrogation of one of her clients, whom she said was a pro-independence activist. Papua police spokesman Kamal said he was not aware of another case.